Lady Selene, oldest daughter of House Ravenwood, lives in a world where the seven major houses are blessed with magical gifts bestowed by the gods. Originally intended to be used together for the overall benefit of the people, the houses have isolated their gifts, instead, and shrouded them in magically-bound mystery. When Selene’s family power of dreamwalkng awakens within her, she discovers dark truths about her parents that force her to reconsider who she thought she was and who she wants to be. Her decision may save her world, but it could also tear her away from the family she loves. There is so much about this story that I enjoyed. The setting was vividly drawn, the magic system was uniquely developed, and the characters were relatable and complex. 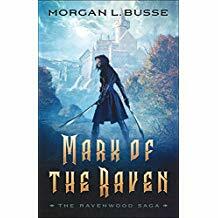 What I appreciated the most, however, was the dark feel Busse gave the story without depriving the characters of goodness or hope. I thoroughly enjoyed Selene, and I can’t wait to read the next installment in this series.